Free Sleep Number Travel Pillow. Click the link below to go to the Sleep Number Facebook page. 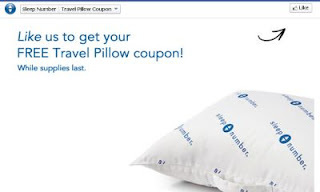 "Like" them to get a coupon for a free sleep number travel pillow. This offer ends April 27th, 2013.